Taco Bell just started testing Cap'n Crunch Delights as a possible future menu item and I got to sample them early on a recent visit to Taco Bell headquarters. They're basically a Cap'n Crunch version of the currently offered Cinnabon Delights. Specifically, they take the same pastry dough as the Cinnabon Delights and add red food coloring to match the hue of Crunch Berries. The cream cheese filling is replaced with a milk-flavored filling and, rather than rolling them in cinnamon-sugar, the Cap'n Crunch Delights are rolled in actual crumbled Cap'n Crunch cereal. How do they taste? Pretty good, especially if you're a fan of Cap'n Crunch cereal. The bits of cereal deliver a nice crunch and a bulk of the flavor. The milk filling is more liquidy and more neutral than the cream cheese version. 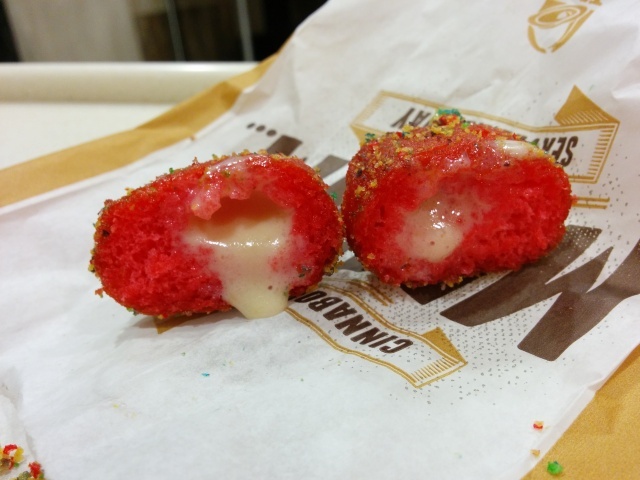 Basically, it's a warm donut hole that tastes a lot like Cap'n Crunch cereal and looks like a giant Crunch Berry. 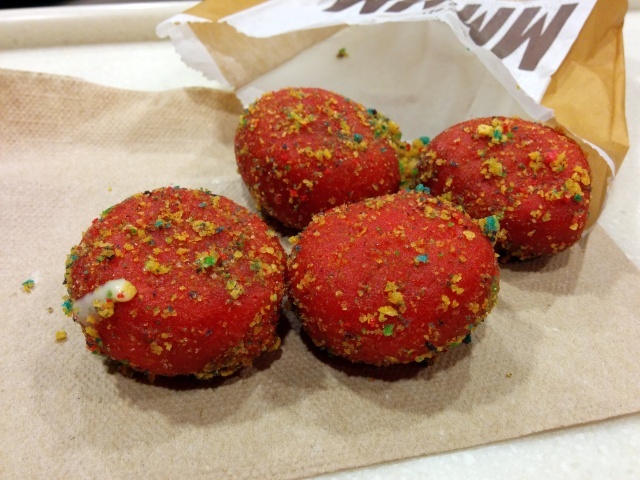 Taco Bell's Cap'n Crunch Delights just started testing yesterday in Bakersfield, CA. If they really like it there, you just might see them across the nation. The price is the same as Cinnabon Delights, which starts at two for $1.